Everybody knows the monarch butterfly, that most charismatic of lepidopterans, depending exclusively on milkweed plants to feed its caterpillars. 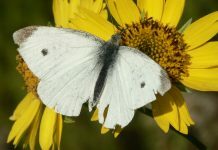 It’s one of the most dramatic examples of a close association between a plant-eating insect and its preferred hosts, and a decline in monarch numbers has spurred a veritable industry of milkweed production, as nature enthusiasts seek to buoy up the butterfly’s population by growing its host plant. It’s also widely known that milkweeds in general are toxic plants, and that the monarch, by being able to tolerate milkweed toxin, deters enemies and largely frees itself of competition for its host plant. Less well known, though, is the degree to which other insects unrelated to monarchs pursue the exact same strategy. Consider, for example, the swamp milkweed leaf beetle, Labidomera clivicollis. 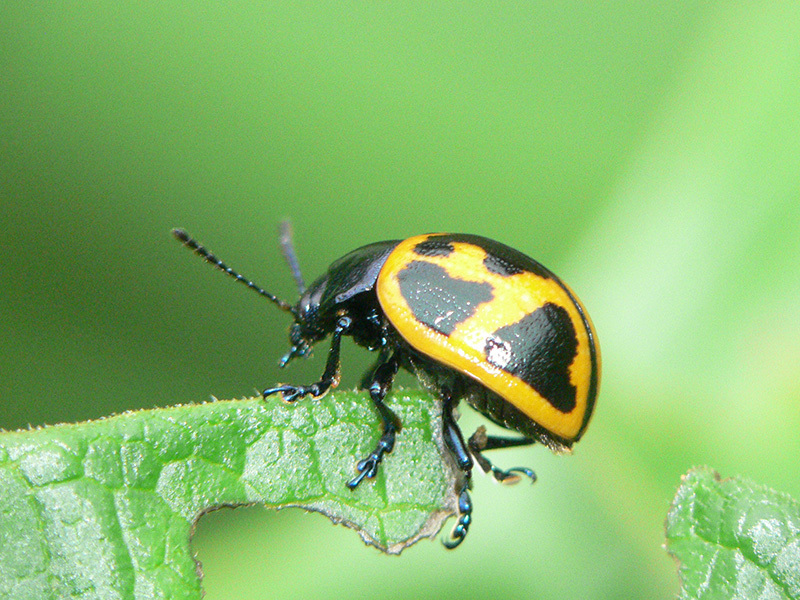 With variable black patches on an orange or yellow ground suggesting a monarch’s coloration, this beetle is common and widespread. But as its name suggests, it’s fussy about food. Swamp milkweed is its strongly preferred host, though it will use other milkweeds as well. I recently found this beetle in my Oak Bluffs yard for the first time, happily munching on butterfly weed, the common orange-flowered milkweed species found on the Vineyard. Milkweeds and related plants such as dogbanes produce a group of chemicals called cardenolides. These compounds are almost universally toxic to animals (including insects), interfering with an important enzyme that helps regulate the concentrations of sodium and potassium ions in the body’s cells. Significant doses of cardenolides can result in cardiac arrest in animals, and as a reasonable response, most animals have evolved the safety measure of finding plants with cardenolides to be bitter and unpalatable. As they feed on milkweeds, both larvae and adult milkweed leaf beetles concentrate those toxic chemicals, just like monarch caterpillars do. Recent research suggests that milkweed eaters are not actually immune to the effects of cardenolides. But they have evolved more tolerance to it than most other animals have, and because the toxins that accumulate in their bodies give them an alarming taste, a diet of milkweed offers them a degree of protection from would-be predators. The benefits of this deterrence outweigh the negative effects of feeding on a poisonous plant. The same system applies to a longhorn beetle that feeds on a milkweed, and to several species of bugs that do as well. It’s notable that all these insects, despite the absence of any close taxonomic relationship, share a basic color scheme: orange and black. This is not coincidental; in fact, it’s a splendid example of what biologists call aposematic coloration. The word translates to something like “warning away from,” and in fact, if a predator samples a milkweed eater and is repulsed or sickened by the experience, it may well steer clear of prey with similar coloration in the future. These species have all evolved the same signal to advertise the danger they carry in their tissues, and the similarity of their coloration means they all reinforce each other’s deterrence. The swamp milkweed leaf beetle occurs across most of the Eastern United States, and while its fondness for swamp milkweed in particular often draws it to wet habitats, it’s clearly a versatile insect. 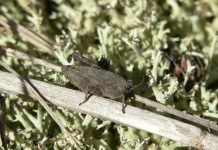 And a randy one, even by insect standards: Males compete fiercely for opportunities to mate, and once mated, zealously guard the female who now carries their genes. 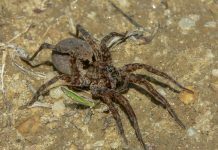 Females are likewise enthusiastic in their efforts to pass on their genes: One study showed that females may mate with as many as 10 males and lay as many as 300 eggs. I’ve got mixed feelings about finding labidomera on my personal milkweed crop. The beetles are voracious eaters, and the reproductive potential of the species means it can rapidly blossom out into great abundance. 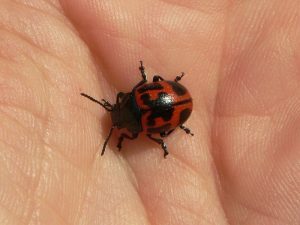 If you Google the subject, you’ll find that milkweed-growing monarch lovers often loathe these beetles as pests, devouring plants intended for the butterfly. I’m a bit more open-minded: I like my milkweeds, but I’m growing them mostly to offer a resource to wildlife of all kinds. And while I like monarchs, I don’t like to play favorites. Swamp milkweed beetles are native, and made it to my yard under their own power, and while I reserve the right to intervene if they start to get out of hand, for now they’re as entitled as anyone to their fill of milkweed leaves.